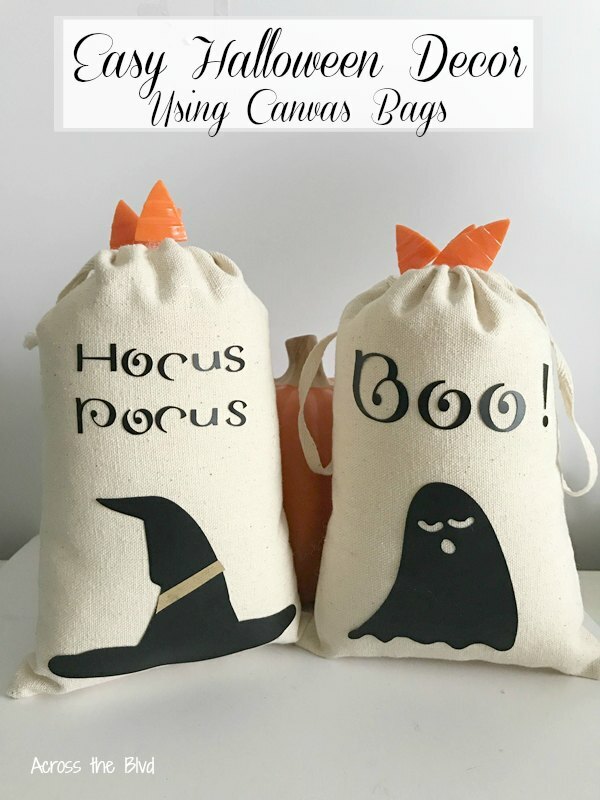 Make this Easy Halloween Decor Using Canvas Bags to add a little fun to your fall decor. I like to keep our Halloween Decor on the not so spooky side. I’ll take cute ghosts, goblins, and silly witches over the creepy and gore of the day. I always add a few simple touches for Halloween to our fall decor. It’s hard to believe it’s already October! That means it’s time for some Halloween decor! 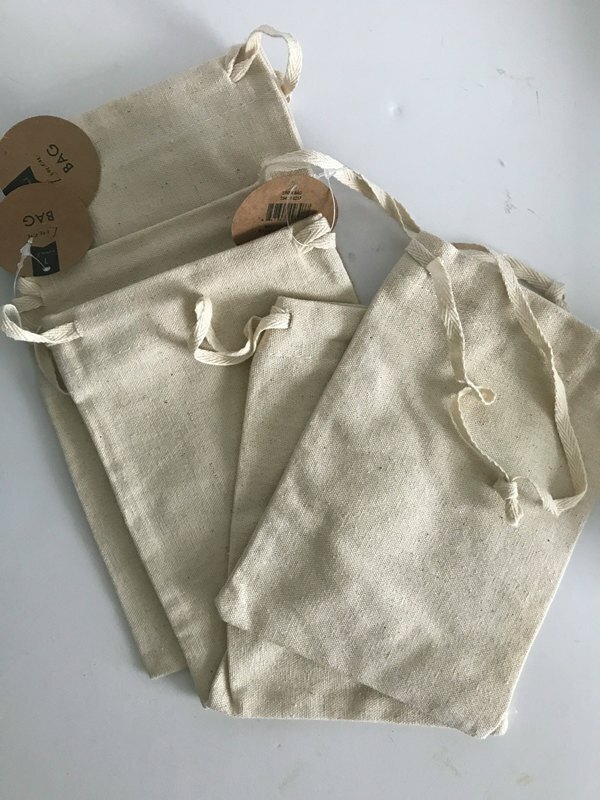 I bought these canvas drawstring bags at the dollar spot at Target last year. I didn’t have a plan for them at the time, so I put them away in my craft stash. As I was sorting through my Halloween items, I found them and thought they would be fun to use for this. 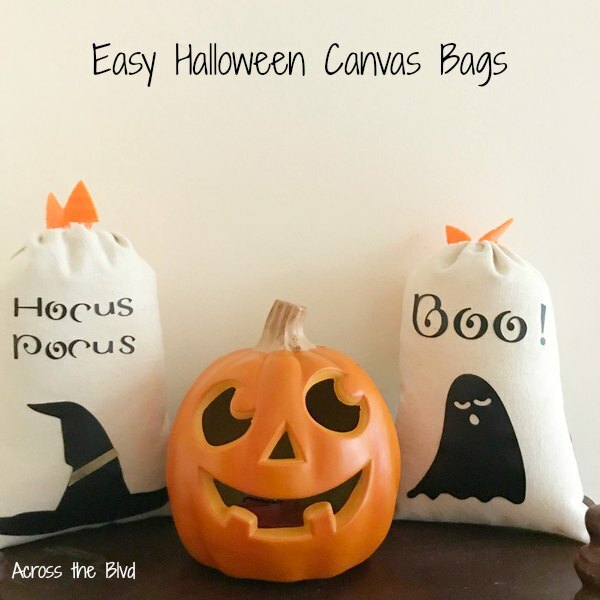 I used my Cricut Air Explore 2 for this project, but you could easily use Halloween stickers or vinyl letters that can be found at craft stores or even the dollar stores. 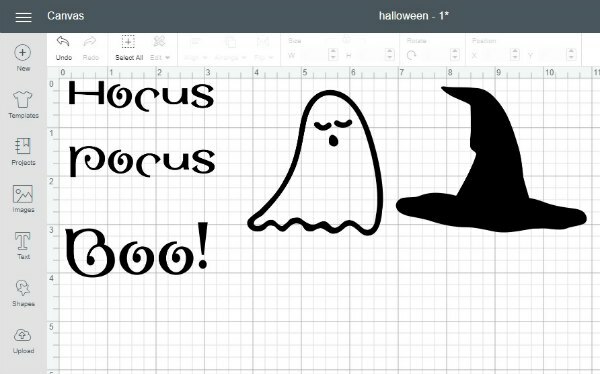 Using Cricut Design Space, I found a font that I think looks fun for Halloween. It’s called Sinah Com Bold. I used images from Design Space of a simple ghost and witch’s hat. I cut them from matte black vinyl. After weeding the words and images, I placed transfer tape on them and transferred them to the bags. I added a strip of gold vinyl to the witch’s hat to give it a better look. 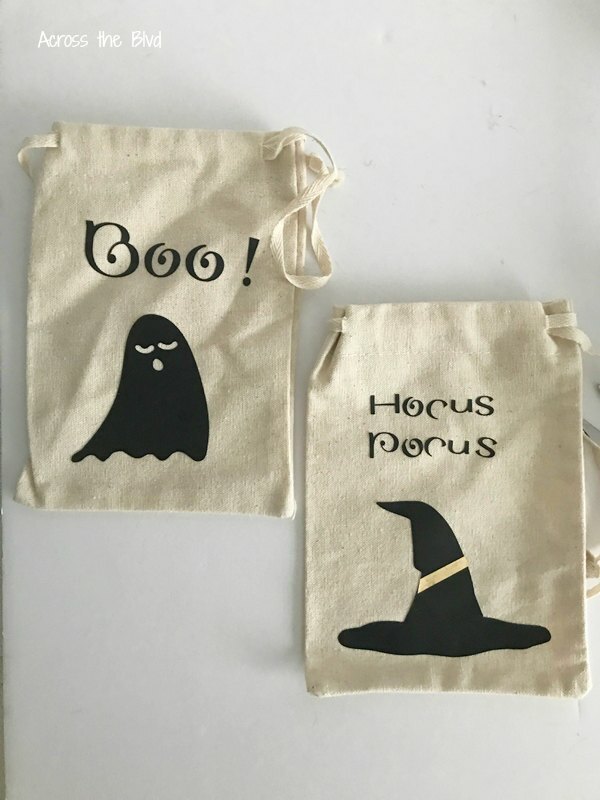 Left this way, these would make fun treat bags to give out to kids at a Halloween party, but I wanted to use them as decor pieces. 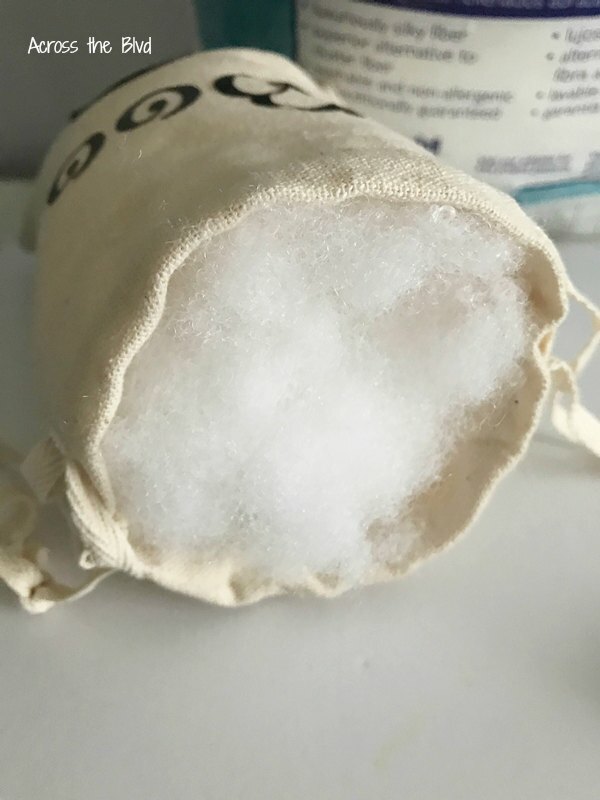 I stuffed both bags with Poly-fill, making sure that they were full enough to stand up. Once I had them stuffed enough, I tied the drawstrings into a simple loop. 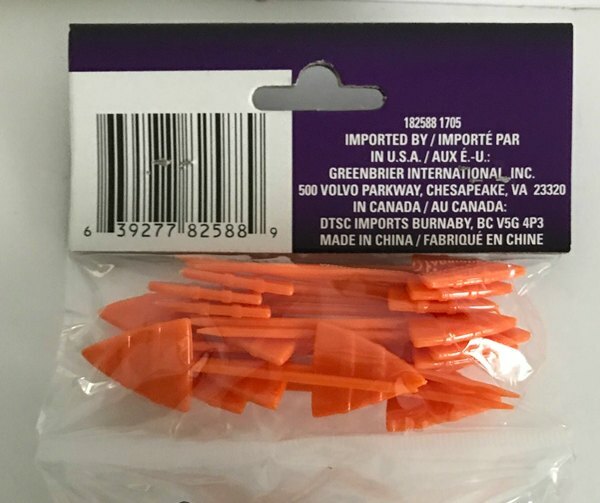 The final addition was to add a few orange cupcake picks to each bag. I pushed three picks into the stuffing of each of the bags. That’s it! 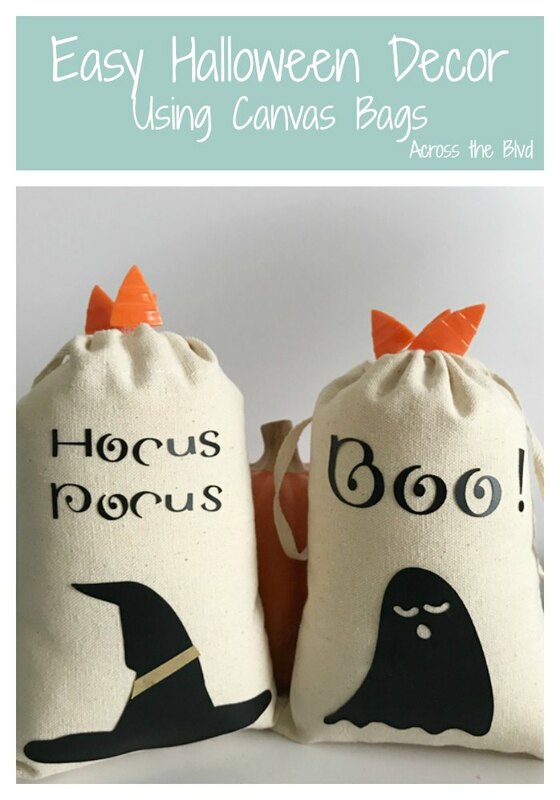 I mentioned this is an easy Halloween project! I’ll use these as part of the tablescape for our Halloween Party. For now, I have them sitting out on a shelf along with a small jack o’lantern. Do you prefer not so spooky Halloween decor? 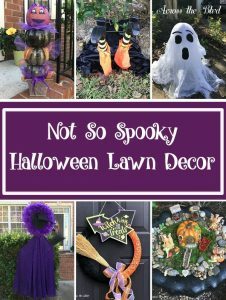 If you do, you might find a few fun ideas from our Halloween Lawn Decor from last year. These are so cute! Target’s dollar spot is great for craft inspo!! I love the designs you chose for them with your cricut. Thanks, Carrie! I love the dollar spot at Target. Using the cricut for fun projects is great. These are easy and super cute! I would add something heavy and use them as door stops too! 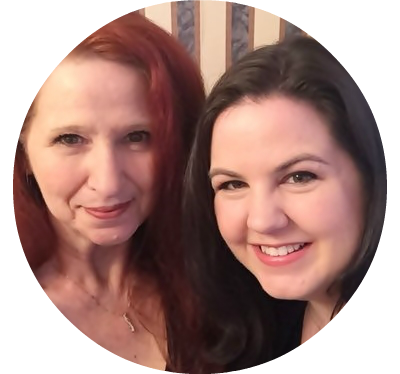 Would love to have you join us at Reader tip tuesday. Thanks, Jodie! That would be a fun use for them. Thanks for the invitation. I’ve just visited your party. 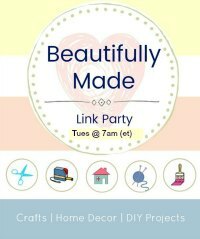 I’d love to have you join us for our party Snickerdoodle Create Bake Make. It opens every Saturday at 5:00 pm (et). Thanks for adding our parties to your lists. We appreciate it! We would love to have you join us for the parties. I’ve been seeing these guys going around and they are too cute! Pinned!Thank you for sharing on Merry Monday! Hope to see ya next week! Thanks, Kim! They were fun to put together. I appreciate the pin and the party. How sweet! 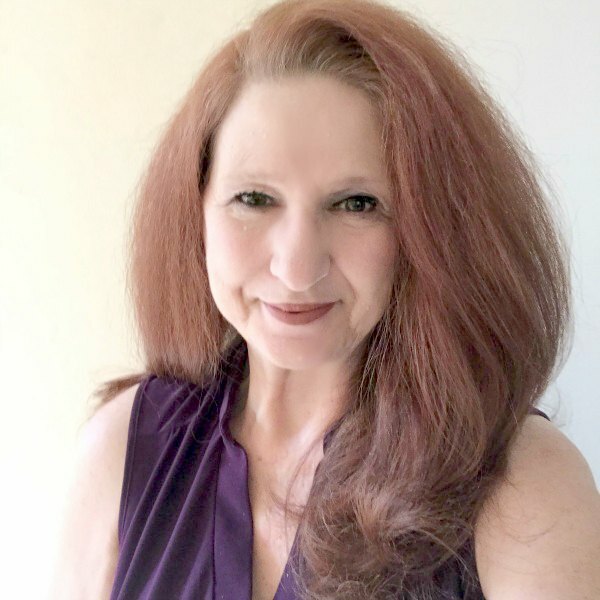 Thank you, Clearissa! Thanks for the party! These Halloween decorations are so cute! I love all of your easy instructions. I made these a feature at this week’s Whimsical Wednesdays Link Party this week. Thank you so much for linking up and have a wonderful week! Thanks, Michelle! And thanks so much for the feature! Hope you have a great weekend. 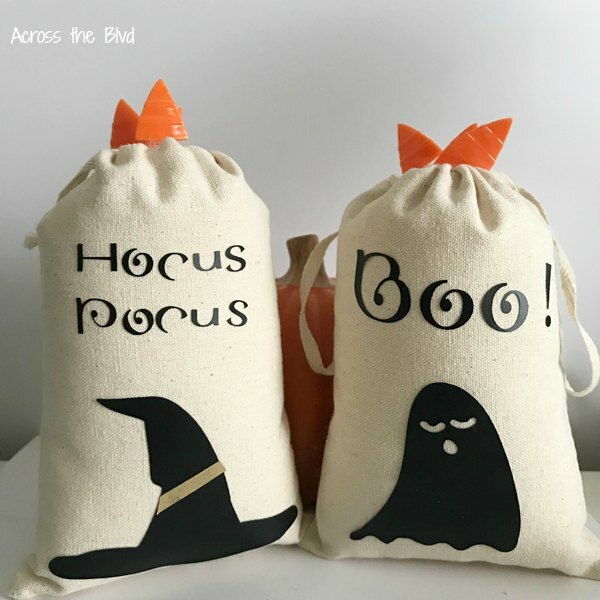 The Halloween bags are adorable! Thank you, Carol! They were fun to make! I know I have commented on these before, i just love them. These are my favorite Halloween post from this year. I can’t say enough nice things about them, so cute. Anyways this post is one of my features from the Hello Fall Link Party. I knew as soon as I saw your post linked up it was my fav! Thanks so much, Leanna! I appreciate the feature and I’m delighted you like these. Thanks so much, Dee! I appreciate the party and the feature!